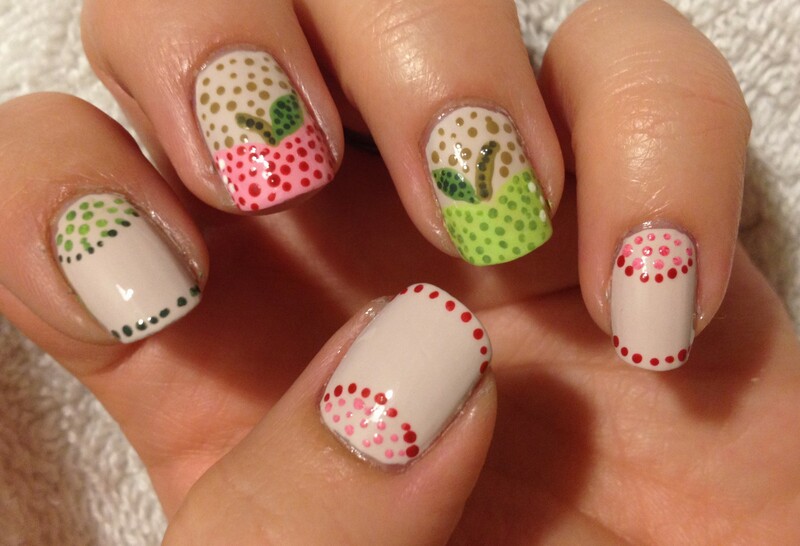 I like to do apple nails in September. I mean, here in PA, fresh local apples are all over the place. For the next 6 weeks, you could pretty much go to an apple festival every weekend around here. Apple cider and dumplings are starting to show up all over the place. I was feeling a little like I had missed my opportunity to do apple nails this month since I didn’t do them on red or green day. Then I started to think hard about what I wanted to do for polka dot day, and I really was having trouble coming up with something that seemed original. 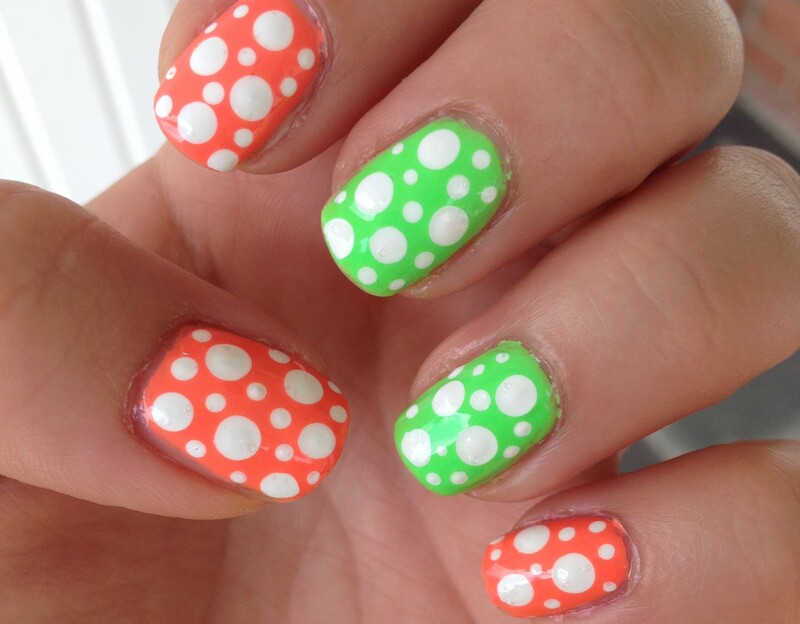 Then it hit me: I can make apples out of polka dots! The base is my frankenpolish, and the rest is just acrylic craft paint. As far as craft paint goes, I don’t own a ton of colors. I have a little set of neon paints, but apart from that I just have the basics: primary colors and black and white. I really like just taking a little blob of red, blue, yellow, black, and white on a plate and mixing them to make whatever colors I need. That’s exactly what I did for this mani and also for my Fairy Godmother mani. Thanks for reading and following along with me this month! And thank you to all of my new followers both here and on instagram! You make me feel warm and fuzzy! See you tomorrow with some stripy nails! This entry was posted in 31 Day Challenge 2014, Nails of the Day and tagged 31 day challenge, 31dc2014, apple nails, apples, autumn nails, fall nails, nail art, nails, NOTD. Bookmark the permalink. Thanks! Sometimes it feels like a struggle to come up with something that is actually original, but this one came to me pretty easily. Thanks for reading and commenting!